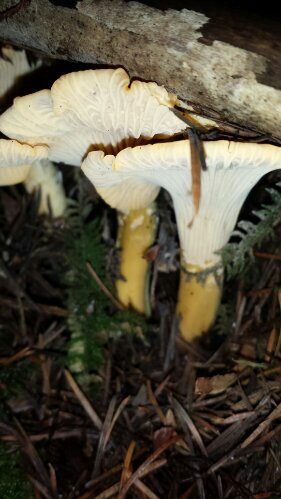 The beautiful golden chantrelle peeks from undisturbed fir needles in back of our little property. What a glorious sight, to happen on a bountiful patch of golden chantrelles. The feeling, after clambering through the branches up the hill and arriving at the top where they were growing in sunny abundance, was like reading Wordsworth’s I Wandered Lonely as a Cloud. 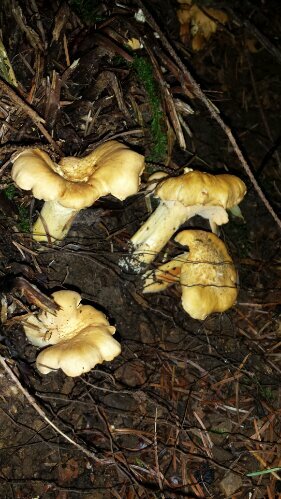 When all at once I saw a crowd, a host of golden chantrelles. 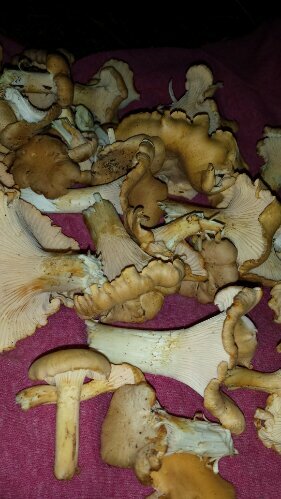 To dry sautee chantrelles, brush gently and well. Pull out pine needles (we do this on site, over the ground.) Slice them. Put them in a skillet over medium – medium-high heat. Salt. Stir constantly. 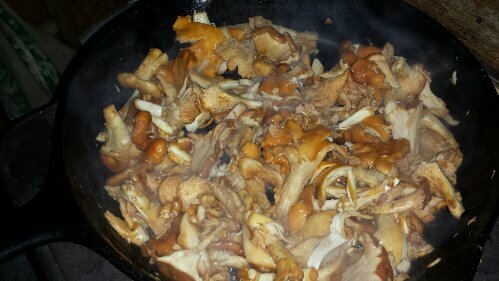 The mushrooms will give off liquid. Cook in their own juices until the juice evaporates. Add a pat of butterand cook 5 minutes more. Add garlic (or whatever, or nothing) cook 2 – 3 minutes longer, or until the Room smells so good, it knocks your socks off. 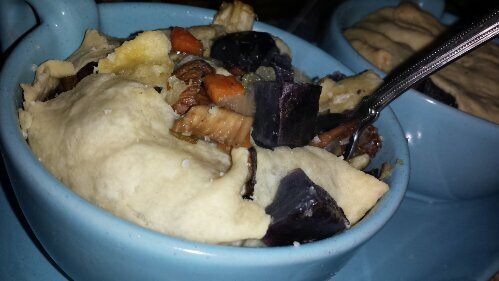 Chicken pot pie was made with sauteed mushrooms, chicken, carrots, potatoes, celery, onion & white sauce in a fresh pie crust. 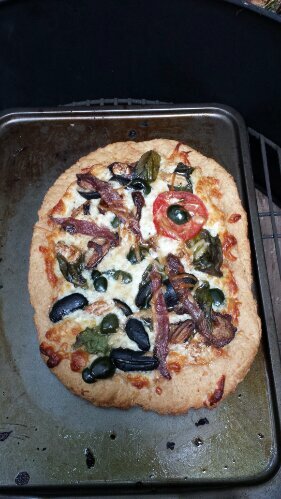 Whole wheat pizza dough topped with mozzarella, fresh olives, basil leaves, sauteed shiitake mushrooms, chevre, tomatoes and anchovies! 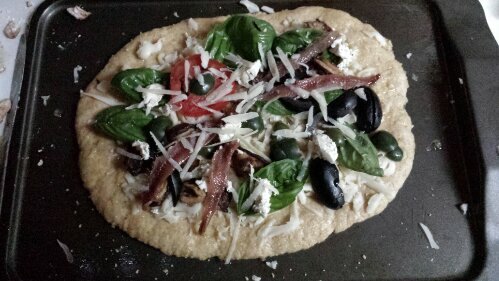 I can’t tell you how great it is to have an oven. 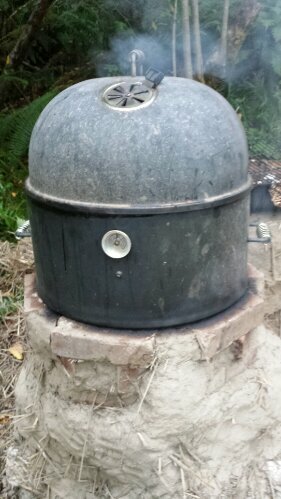 I’m getting used to controlling temperatures by the size and consistency of flame. On the menu tonight, glazed carrots with blood orange juice, garlic and preserved lemons and jalepeno corn bread. I also started a sour dough starter with potato water. I’m trying to collect wild yeast. We’ll see.